As this blog reported earlier, the UN Commitee on the Rights of the Child (CRC), sensitised by an exhaustive Thematic NGO Report and a Thematic Briefing on IGM on a Global Scale by StopIGM.org, repeatedly questioned Chile over IGM practices, despite the fact that an NHRI as well as an NGO report both failed to substantiate the obviously ongoing practice in Chile, and the government only gave evasive answers regarding their obligation to protect intersex children from unnecessary, non-consensual and mutilating genital surgeries a.k.a. 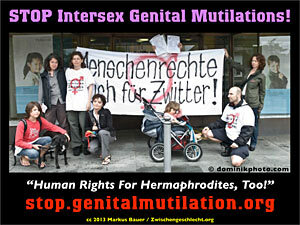 Intersex Genital Mutilations. In the meantime, CRC published their binding “Concluding Observations”, which – as were hoping for – contains strong paragraphs on IGM practices, again explicitly identifying IGM as a “Harmful Practice”, and calling for “effective remedy for victims, including redress and compensation”! THANK YOU!!! 48. While noting the proposed development of a protocol for the health care of intersex babies and children, the Committee is seriously concerned about cases of medically unnecessary and irreversible surgery and other treatment on intersex children, without their informed consent, which can cause severe suffering, and the lack of redress and compensation in such cases. 49. In the light of its joint general comment No. 18 (2014) and No. 31 of the Committee on the Elimination of Discrimination against Women on harmful practices, the Committee recommends that the State party expedite the development and implementation of a rights-based health care protocol for intersex children, setting the procedures and steps to be followed by health teams, ensuring that no one is subjected to unnecessary surgery or treatment during infancy or childhood, protecting the rights of the children concerned to physical and mental integrity, autonomy and self-determination, providing intersex children and their families with adequate counselling and support, including from peers, and ensuring effective remedy for victims, including redress and compensation. Nuremberg, 22.10.2015: Peaceful Intersex Solidarity Protest for “Hermaphrodite Lawsuit” vs. IGM Surgeon + University Clinic!